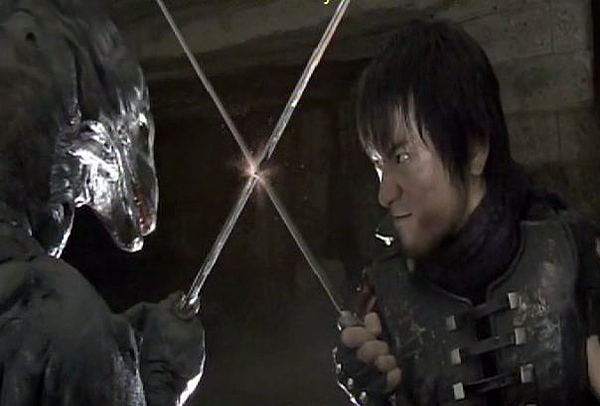 I’m delighted – DEE-LIGHTED – to wrap up Monsters and Masks Month 2010 with an early review of Sushi Typhoon’s Alien vs. Ninja from action auteurs Seiji Chiba and Yuji Shimomura. This thing’s been a big hit at film festivals the past few months, and having just watched a screener rushed to us from the good folks at Funimation, I can see why. Only slightly less pixel-based than NINJA GAIDEN. Alien vs. Ninja does something the likes of Aliens vs. Predator, Freddy vs. Jason, Mega Snake vs. Giant Octopus, even King Kong vs. Godzilla ultimately failed to do; DELIVER on the promise of the title. What you get here is a bunch of ninja fighting a bunch of aliens. And that’s pretty much it! No overcomplicated story, no extraneous characters or side plots, no taking itself too seriously. The ninja are on screen early, the aliens attack right away. Seems so simple, yet why do all those other ‘versus’ flicks save what you’re there to see for the often too-short final scenes? Maybe Chiba’s the difference. When a film is written and directed by an action and effects guy, you know he’s going to stay in familiar territory and not try to recreate Citizen Kane. 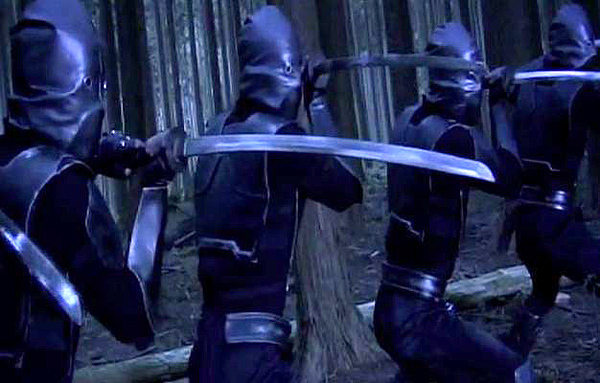 Although AvN will probably go down in history as the ‘Citizen Kane’ of monster-infused ninjasploitation. 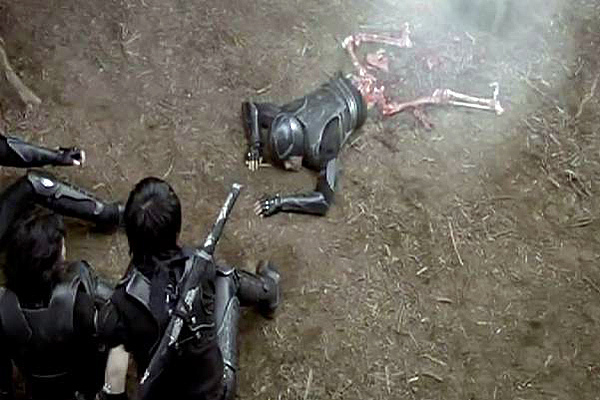 ...some ludicrous gore bordering on silly and you're set up for a pretty good film. BUT WAIT! Add a legion of slimy mutating aliens to the mix and you end up with something special. The eponymous extraterrestrials of AvN are derivative of both Giger’s Alien and… um… FLIPPER. I didn’t like the Soichi Umezawa creature design at first, but as things progress the goofy snouts and cheapness of the suits start to really work with the crazy-8 bonkers tone of the film. 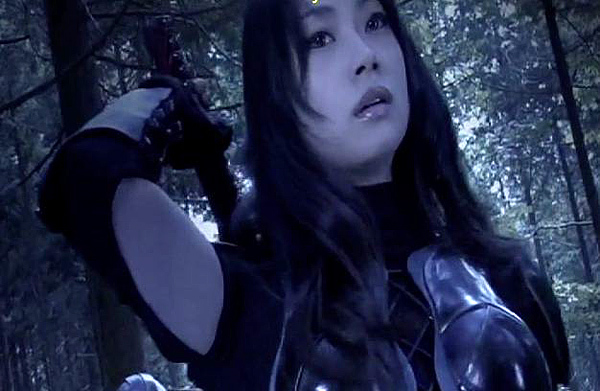 The real gem of AvN is the kunoichi Rin played by Mika Hijii, last seen in Isaac Florentine’s Ninja. Clad in a latex catsuit with armor accentuating all the right bits, she’s cute enough to turn aliens into groping perverts (literally). Luckily her ninjutsu skills include a variety of splits and leg scissors, and luckier for us, the camera is always in the right spot when such moves are executed. No better way to dodge a phallic alien tail! Mika steals the show in the third reel, stomping an alien in the crotch with high-heeled boots (alien’s got nards! ), pulling slimy pink alien fetuses (ew!) out of various orifices of zombified ninja, finding the creature’s weak spot – THE TAINT! – and generally scoring all kinds of style points strangling opponents with her legs and thighs. In a film full of good fights, the showdown with the boss alien is the best. With the alien’s ability to mimic opponents, we actually get a man vs. monster swordfight! Male lead Masanori Mimoto eventually has to bust out some pro wrestling and MMA to take him down, with a few nods to video games in there for good measure. Action Directors Yuji Shimomura and Kensuke Sonomura hit home runs all around. 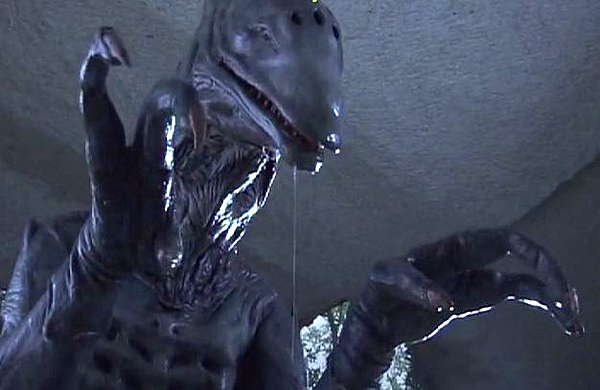 Alien vs. Ninja watches like a director’s fight reel…with monsters! It is post-Versus Japanese indie cinema at it’s exploitation-budgeted finest. A live action video game that while often played for laughs always delivers serious action. The fights are so frequent and satisfying, you forgive some flaws. A comedy relief character could be cut out entirely (although his death scene is perhaps the biggest laugh in the movie). The very end goes really hokey digital, too, and is best forgotten. 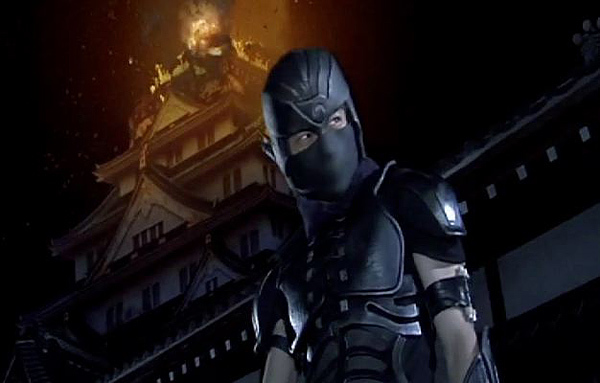 But you’re not going to have more fun with a ninja movie than this. Watch it with a group, or make it a party flick. Simple, straight forward, solid. AvN is confident in what it is and doesn’t try to be anything it can’t. It’s a cheeseburger. It’s not claiming to be a steak. And what’s better than a good greasy burger when you’re in the mood? Alien vs. Ninja is on the festival circuit right now, and due out on domestic DVD sometime this winter. In the meantime check out Death Trance, an earlier Shimomura/Chiba flick also heavy on costuming, creatures and damn good fights. Read IFC’s “I Can Sum This Movie Up in Three Words” review here. And here’s a bunch of shots of Mika Hijii looking CUTE with a wakizashi!